President and Chief Technology Officer of Edit Creations, Inc.
Tom has been working in the broadcast industry since 1987 and has extensive experience editing corporate, broadcast and documentary programs. Tom has worked with a long list of nationally recognized companies and agencies including, Young and Rubicam, J.Walter Thompson, United Airlines, Better Homes & Gardens, Sears, Lions Clubs International, and Warner Brothers. You've seen his work on CNBC, United Airlines in-flight programming and major market television stations across the country. Today he continues to seek new business opportunities while working with Edit-Creations' ever-expanding client base. Have FCP, Will Travel… Please Let Me Travel! This week I have the good fortune of getting out of the cold Chicago weather and editing in sunny California. 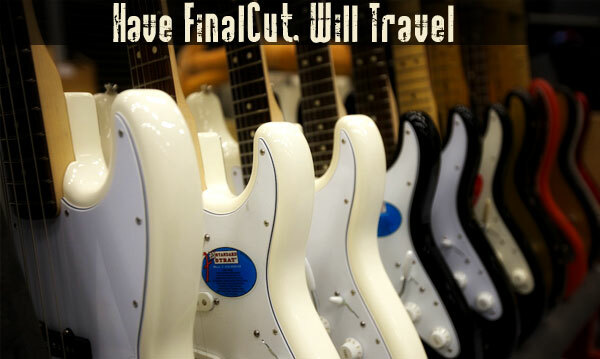 I’m was brought out to do some on-site editing for Fender at the NAMM convention in Anaheim. Like every travel job that I do, there are unique needs that needed to be addressed. No two jobs are exactly the same. The needs of this job resulted in me having the most sophicated travel setup I’ve had to date. Here are the details of the job. NAMM is a convention that showcases manufactures of musical instruments and gear. It’s kind of the NAB of the music industry. Fender has one whole floor of the convention center, and my job is specific to what they’re doing here. There are 3 main areas of their venue. The Stage, where there will be live performances, both planned and as people walk up and just want to jam. There is the exhibit area where booths are setup for all of the separate companies that are under the Fender umbrella. And then there’s the “floor”, where people are just socializing and moving from one place to the other. All of these are being covered by video, and as quickly as possible edited down and posted to the web on the Fender website as well as many social media sites. Read moreHave FCP, Will Travel… Please Let Me Travel! Video compression has come a long way from the days of using Cinepak on a Quadra 950 tower and the old NuBus slots. For the most part, the wars between online formats has been settled with Flash leading the way. But behind that Flash Player is often H.264 encoded video, ever since it was introduced with Flash 9 in December of 2007. Even video powerhouse YouTube is pushing out H.264 video wrapped in a flash player. If that’s not enough, one of the officially supported video formats for Blu-ray is H.264. So from on-line video (SD or HD) to high end Blu-ray DVD’s, h.264 is a huge player. It’s all good, right? Well, mostly. 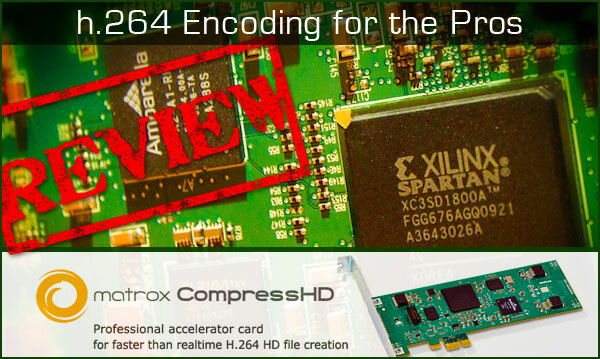 Have you ever compressed an h.264 video file? It can be unbearably long. We first started running into this bottleneck when we switched from doing mpeg-1 client web approvals (something that was very fast to compress and widely compatible) to h.264. We switched mainly because we wanted to post high resolution web approvals for our clients at higher quality, and MPEG-1 just wasn’t cutting it. H.264 really filled that need. But even a shorter video, say 10-15 minutes could take 60-90 minutes to compress on a Quad Intel MacPro, and some of our videos are more in the 30 minute range. 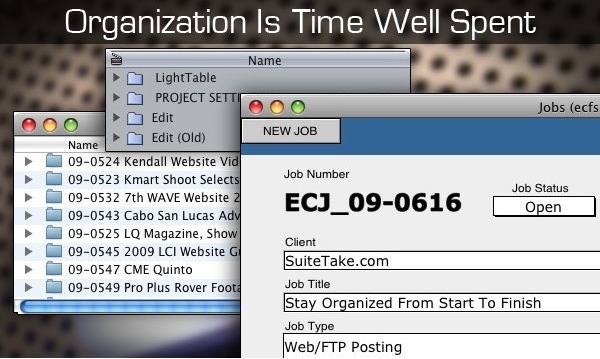 If you have the time, leaving it running overnight is no big deal, but most of the time we’re doing these web approvals close to 5 or 6pm and they needed to be posted and sent to the client that same day. Waiting around just to finish a web post feels like a waste of time (although we did minimize this to some degree using LogMeIn as covered in my previous post). 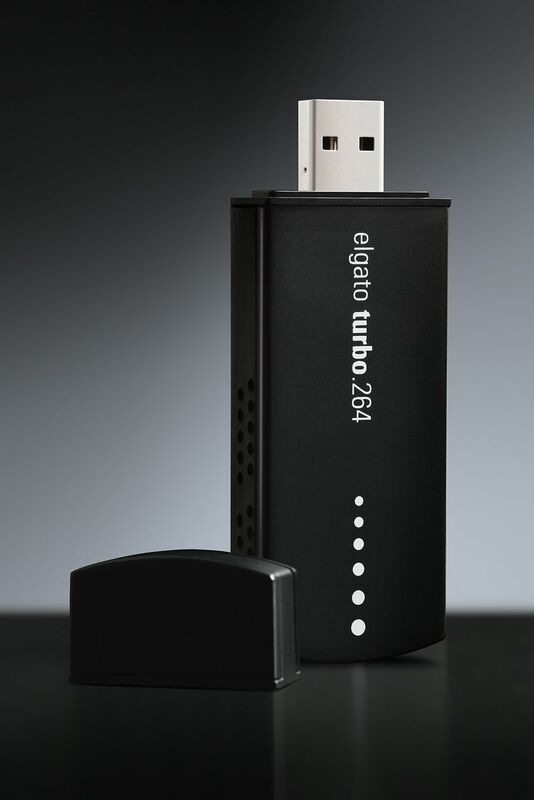 After hearing others brag about how great it was, we finally decided to try the “to good to be true” Turbo.264 USB key from Elgato (the non-HD version). I really fought it because I had a hard time believing that a little USB key could do what my huge expensive multi-processor MacPro could not. But also because it did not integrate with Compressor, which is part of our workflow. For the price though, we decided to give it a try. For what you end up paying, the Turbo.264 does a pretty good job. It is FAST for sure, and the output is not too bad, but it’s not perfect either. It gave us the speed that we wanted, but not the quality. One of the main reasons it’s able to do what it does so fast is that the very first thing that’s done is resize the video frame, and then pass it off to the USB key for processing. This is key, because the rest of the processing is done on a lower resolution frame instead of working with the original uncompressed frame. Great for speed, but not optimal for quality. But for many people, this might just do the trick depending on your needs and budget. You end up seeing compression artifacts in places that you wouldn’t when using compressor with similar settings, typically areas of fast movement, effects or dissolves. But it did take care of the time bottleneck that we were having. So we decided to sacrifice some quality for the sake of actually getting home on time but continued to look for other options. IMPORTANT NOTE: This post was updated on Wednesday; November 4, 2009 with new information regarding resizing partitions on the Drobo using iPartition. 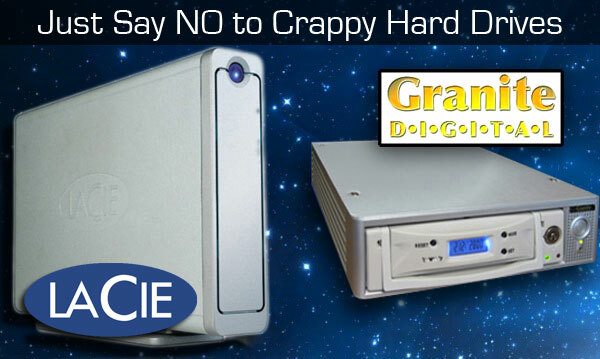 As brought to my attention by reader Bradley Davidson (thanks Bradley), iPartition does not actually support the method that I mentioned, and neither does drobo directly. In my testing, I performed the resizing operation on a newly formatted drive that didn’t have any data (since I had just lost all of my data that was on the drobo). If you try to resize a partition as outlined in this post, you WILL LOSE YOUR DATA. So don’t try it. In theory it was a great idea, but apparently this too will cause problems. You can find more information on the iPartition website, as well as from Drobo. Like we’ve pointed out many times, we’re also learning here at SuiteTake so thanks for the feedback. Before I start, let me just say that I am a Drobo fan. I have 2 of them (an original USB and a newer FW version) and plan to purchase more Drobo’s in the not too distant future. Overall I’ve had a great experience with the units and when I needed assistance their tech support was very helpful. All of that being said, there is a dirty little secret that they don’t warn you about and if you’re not careful you can have your Drobo crash beyond recovery, which is what happened to me this past week. I lost nearly 4 TB of files and there was nothing I could do to get them back. 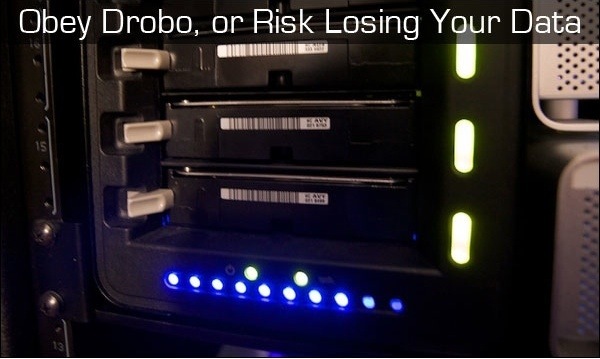 If you own a Drobo, this is a must read. Hard drives the single most important piece of tech we use as digital media professionals. When you think about it, every bit of work you do is saved to these mechanical/magnetic devices spinning at thousands of RPMs. You may spend hours, days, weeks or even months on a project – and all the time you’re trusting that the drives do not fail you. If you really let your mind dwell on it you may actually start to lose sleep! Having regular backups is important enough (that’s for another day, another post) but how about starting with a quality drive system? I’ve seen too many people buy drives for their edit systems based on price and price alone, only to be burned and burned bad. 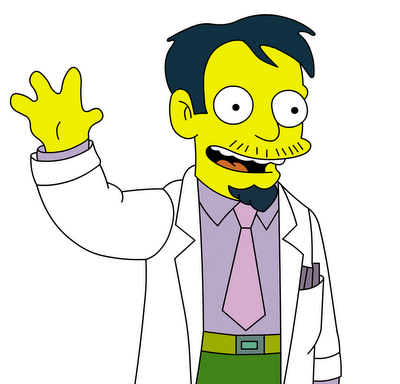 It’s like shopping around for a heart surgeon and going with the cheapest guy. I was told a story about an editor that was working on a big show for the Discovery channel for over 3 months, and 5 days before he was to master the show his drive system went down and all was lost. Every bit. There was no way to recover 3 months of work in time to make the broadcast date so they not only lost the job and all future work from Discovery, but 3 months of revenue that they had already worked for. Just pause and think about that. That’s the kind of thing that some companies can never recover from. 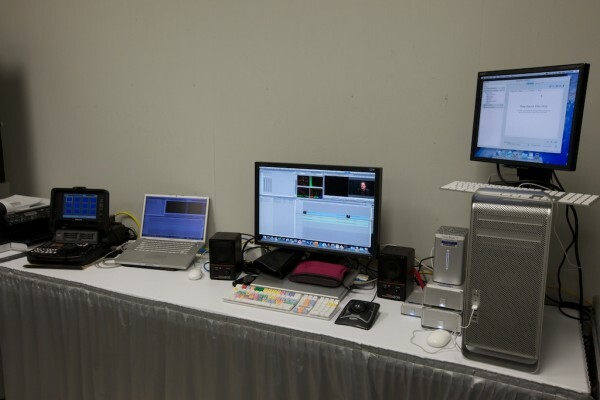 At Edit Creations we have a job that we do every year that lasts from January through the end of June (2 rooms, 5 days a week), creating multiple videos and various programs that all play at a show in July. Whenever we start to come down that home stretch I remember that story and start to get a bit nervous. I’m always making sure that our backups are in good shape. This post is all about making sure the drives you buy are worthy of the work that you’re doing. Or more importanly, that you avoid the drives that are not. So while it’s true that I am in fact a Mac Addict, I also consider myself a well rounded computer nerd. 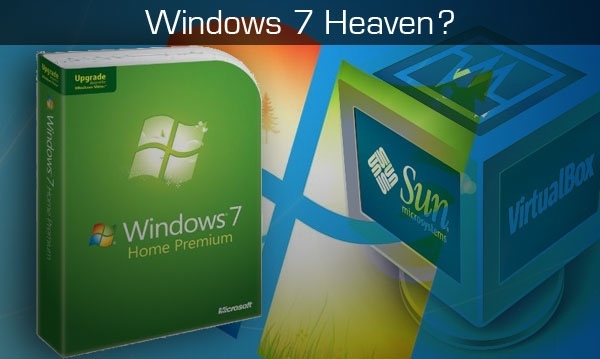 So it shouldn’t be too surprising that I’ve been using the beta version of Windows 7 almost since it came out. While most of what I do is on the Mac, there’s no avoiding using the accounting computer when I do invoicing and receivables (yes I know there is QB for the Mac but there are many issues with it and that’s a whole different conversation). And I can tell you from personal experience that Visa has been pretty slow and buggy for me. Another way we use Windows is to check WMV files. While you can check them using Flip4Mac, VLC Player and the really outdated Windows Media Player for Mac, there are technical issues with all of all of these when it comes to doing a 100% QC check. In recent weeks we’ve had to watch over 100 VMV files, start to finish, to check them before sending them out for a huge Wachout presentation. The only true method we found of checking them, with confidence, was installing Boot Camp onto one of our machines and booting into Windows natively. It’s amazing how much better the files looked, and how much more smoothly they would play in that environment. So when the free beta version of Windows came out a few months ago and I started hearing good things about it, I decided to give it a try. I installed it as both a virtual machine on my MBP, as well as a Boot Camp volume natively. What really struck me was that running Windows 7 under virtualation inside the Mac OS was actually faster than running Vista natively on our accounting PC (a 2 year old laptop). When running in under Boot Camp, it screams and feels very fast and fluid. I wasn’t planning on sharing this on the blog but recently Microsoft did something they’ve never done before. They lowered the price for all pre-orders to $50 for a upgrade version of Windows Home Premium. That means if you have a copy of XP or Vista, you can upgrade for $50 for a limited time. Once the software is released on October, the price goes up to $119. Full versions are $199 and up. So if you have a PC in your life, this is worth buying. If you’re not sure, download the Public Beta of it now and run it using Boot Camp or Sun VirtualBox. Both are free! If you like it, get on board and buy it before the price more then doubles. It’s what Vista always wanted to be. I purchased 2 copies, one to run on my laptop in virtual mode, and one for our QC Boot Camp machine. And don’t hate me because I use a PC. I’m still a Mac at heart.